A new DVD short-length dramatic motion picture by former BBC documentary filmmaker Jon East, presents a fictional but sympathetic and moving account of Dr. Wilhelm Reich, his supporters and his persecutors. This high-budget film was shot on 35mm to Hollywood movie standards and successfully played at major international film festivals (Venice, Cannes etc) in 1999. Now available for the first time on DVD, the film has been newly digitally transferred and comes complete (via an interactive menu) with behind-the-scenes 'making of' footage, a biographical essay on Wilhelm Reich and cast and crew notes. The film depicts Dr. Reich and his co-workers in his laboratory in Rangeley Maine, (using the orgone accumulator, giving therapy and lecturing on infant care). Soon Federal agents from the Food and Drug Administration (FDA) invade the premises, disrupting the work and burning Reich's books. Dr. Reich watches history repeat itself, noting that, "It could be worse. The Communists and the Nazis weren't content with burning my books, they wanted me on the fire as well!" Finally Reich uses the cloudbuster to win an emotional and symbolic victory. The film starts with a "fake documentary" presenting the FDA's jaundiced view of "Reich the quack", made in the style of the melodramatic 1950s anti-crime films, and ends on a hopeful note, that Reich has opened the way for humanity to the stars. It will alternatively leave you laughing, and crying with sadness. 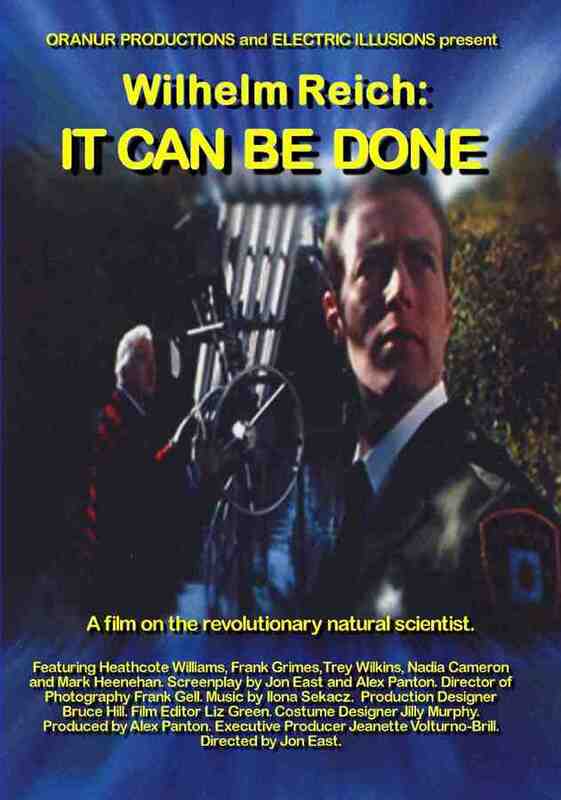 Originally produced partially as a marketing 'teaser' for a feature-length movie, "It Can Be Done" has grown in popularity and interest. The film's title itself came from a sign posted to Reich's laboratory wall, as an encouragement to his associates. Presented in anamorphic 1.85:1 widescreen, dolby stereo, main film 22 minutes, additional footage 5 minutes. In plastic case with color wrap. Price: $24.95 DVD Multi-Region (will play worldwide)* LIMITED COPIES AVAILABLE - WILL SOON BE DISCONTINUED. "A fictional interpretation of true events. The film dramatises an apocalyptic episode from the remarkable life of maverick scientist and sexual revolutionary Dr. Wilhelm Reich (1897-1957). Set in the USA in 1956 the film corrects some of the widespread misunderstandings that continue to surround this most unusual man. Although events have been conflated, it is a truthful if poetic account: not only of Reich's breadth of outlook but also of the sinister forces that connived to destroy him. Visually I wanted to achieve a 'transparent' directorial style that didn't compete with the actors' performances for the audience's attention. Rather I aimed to create an epic feel that would both subtly reflect the beauty of Reich's holistic scientific vision and the enormity of the crime visited against it." NOTE TO INTERNATIONAL BUYERS: You may get a better deal on international postage from Amazon.com which also sells this DVD (they get it from us). We cannot compete with their international shipping rates, though we are generally faster to ship.